Recipe development has always scared me. I’ve been baking for a while now, so it was only a matter of time until I finally made something up myself. Baking is a science and that means that if things aren’t exact in the formula, it can go south fairly quickly. 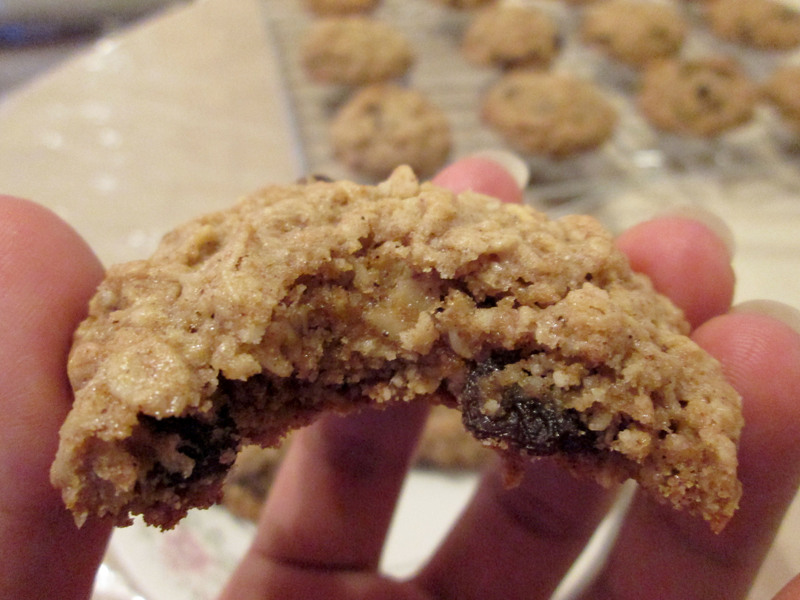 I set out on trying my hand at cookies as my first attempt at sweet recipe development. 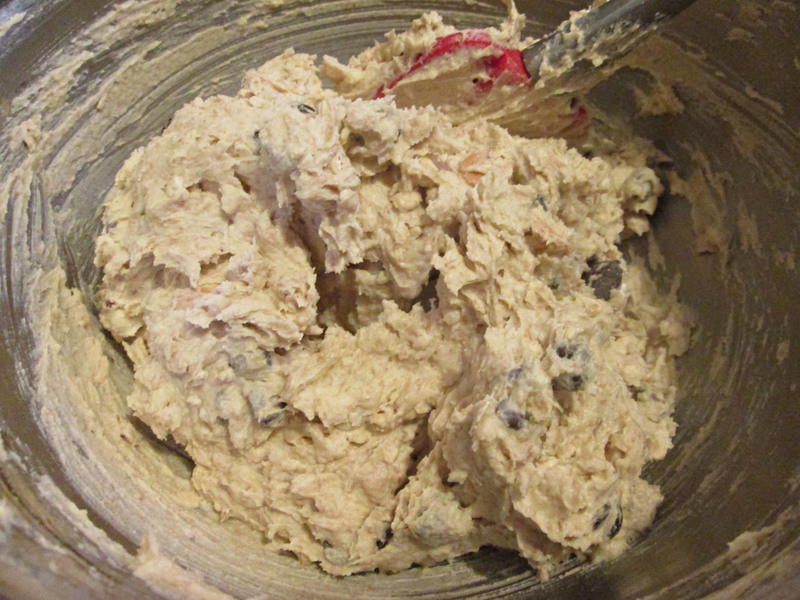 The first thing I thought to myself was: “how many of my favorite mix-ins can I put into a cookie dough?” With that in mind, I looked for a guide to help me formulate this recipe. Michael Ruhlman’s “Ratio” was the help I was looking for. 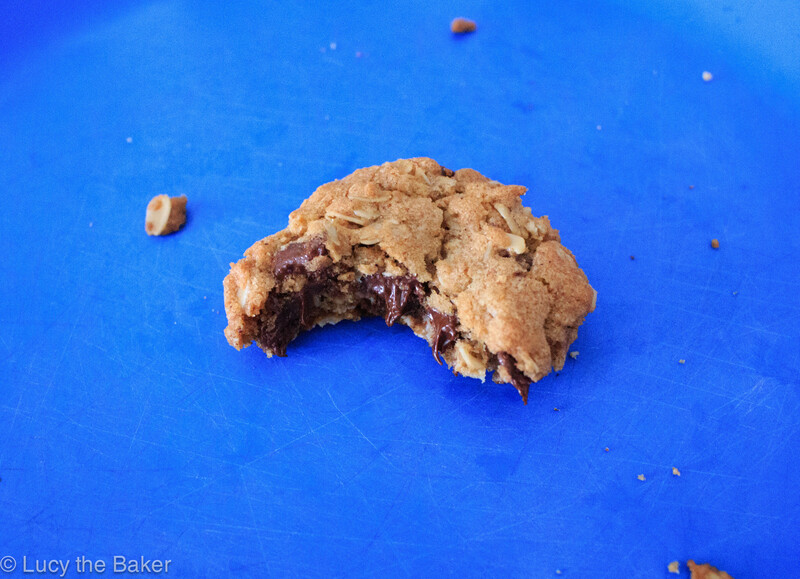 I read and re-read the chapter on cookies one day at work, and without looking at the recipes included in the chapter, I used his formula and wrote my first draft on a piece of scrap paper. The formula is fairly simple: 1 part sugar: 2 parts fat: 3 parts flour. This formula is the same one behind chocolate chip cookies, which is what I was going for. He measured by weights but I wanted to measure by volume, so my ratios were; 1/2 cup of sugar: 1 cup of butter: 1 1/2 cups of flour. From there, everything else was easy. 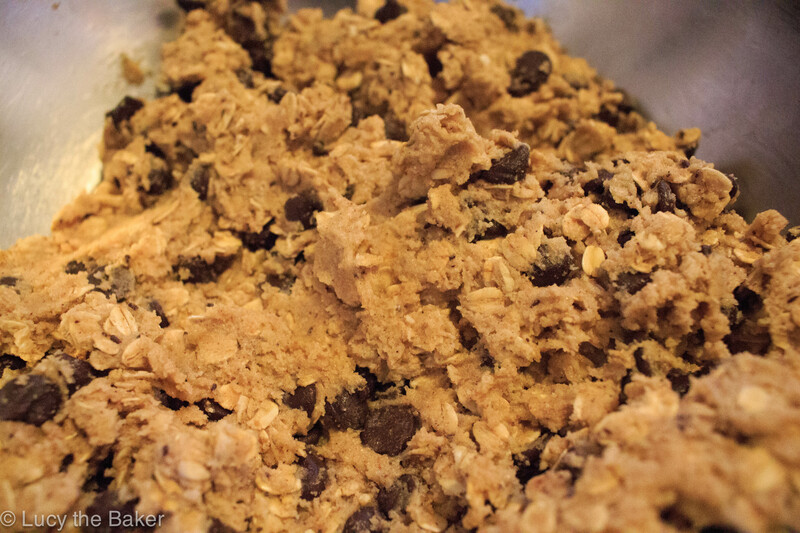 I knew I wanted to put as many mix-ins as I could, but ended up settling for four: rolled oats, chocolate chips, butterscotch chips, and pretzels. 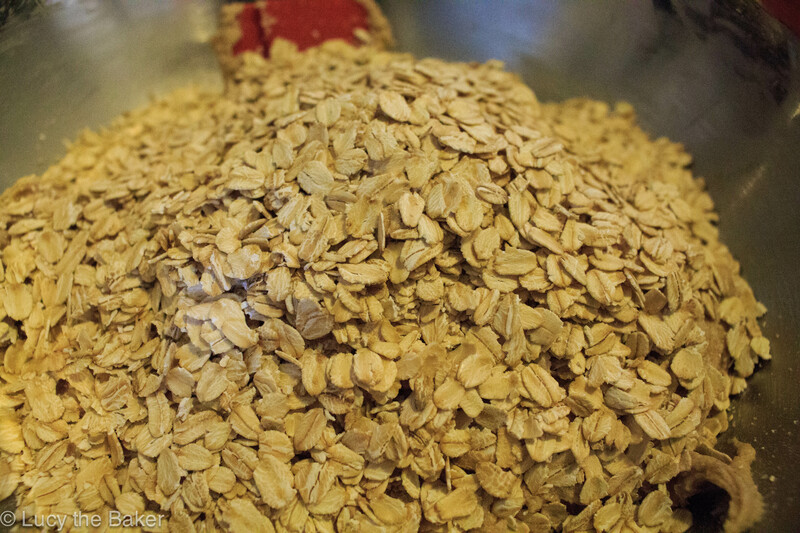 In my first draft, I wanted to replace some of the flour with ground oats, and chop up the pretzels to incorporate it into the dough. Satisfied with my first draft, I made my first batch of cookies and ended up failing. 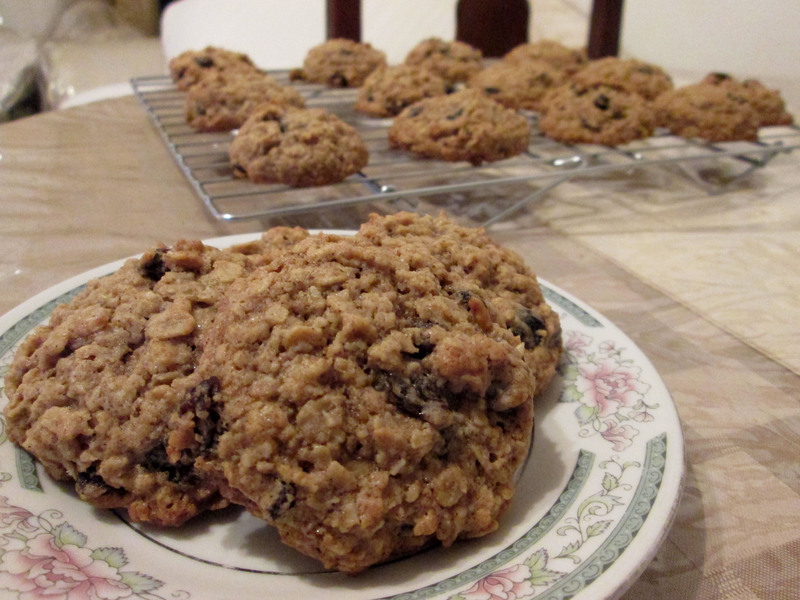 Since I took out some of the flour for oats, the cookies were too brittle and barely made it from the tray to the cooling racks. 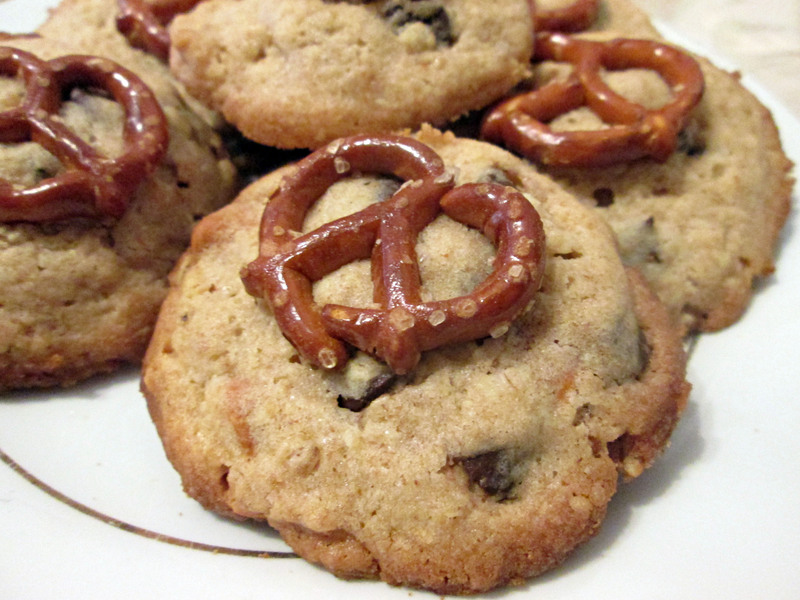 The chopped up pretzels weren’t much help, as they made the cookie heavier and took over the entire cookie. I took my scrap paper and went back to the drawing board. 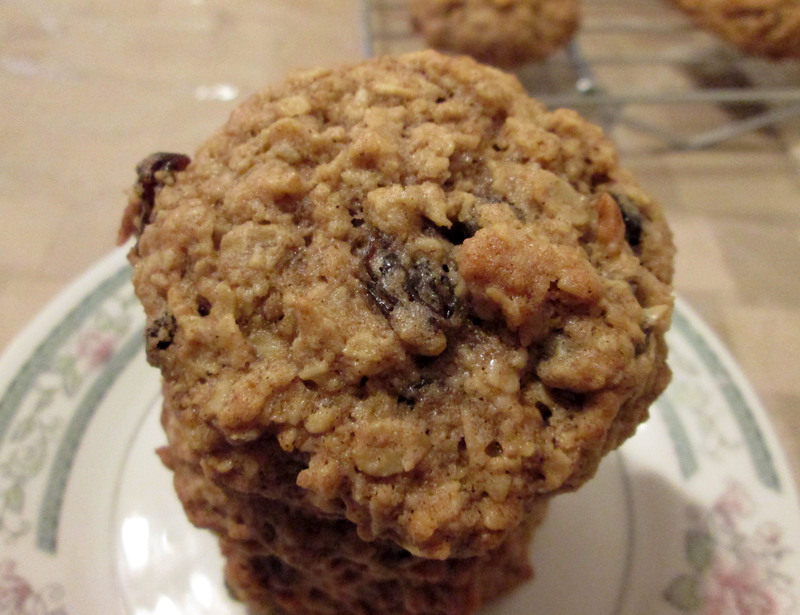 Not to be defeated by a failed batch, I decided to put back the flour I took out and incorporate the rolled oats as a mix-in. 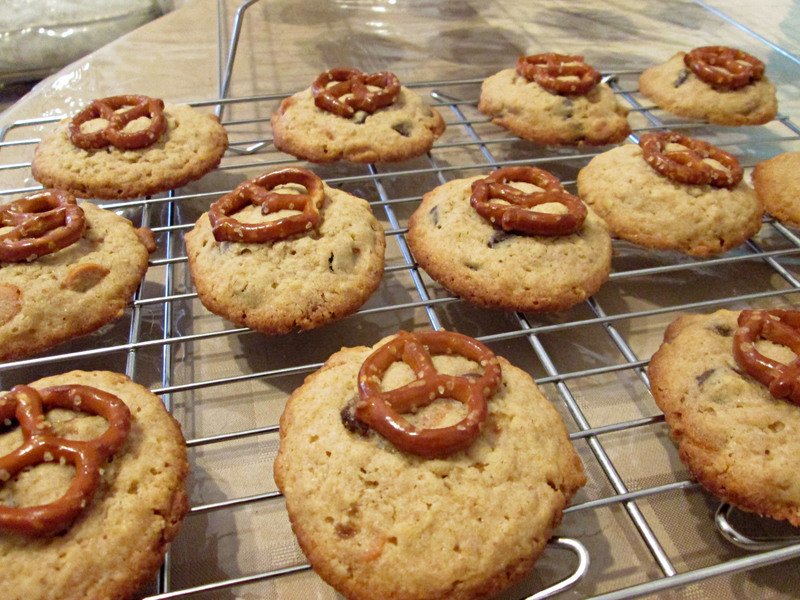 I also took the chopped pretzels out and opted to top each scoop of dough with one instead. I said a little prayer and popped them into the oven on my second try. It took me two weeks to try to make this recipe and I think it was definitely worth the wait. The cookies came out with the right structure; sturdy but not heavy. 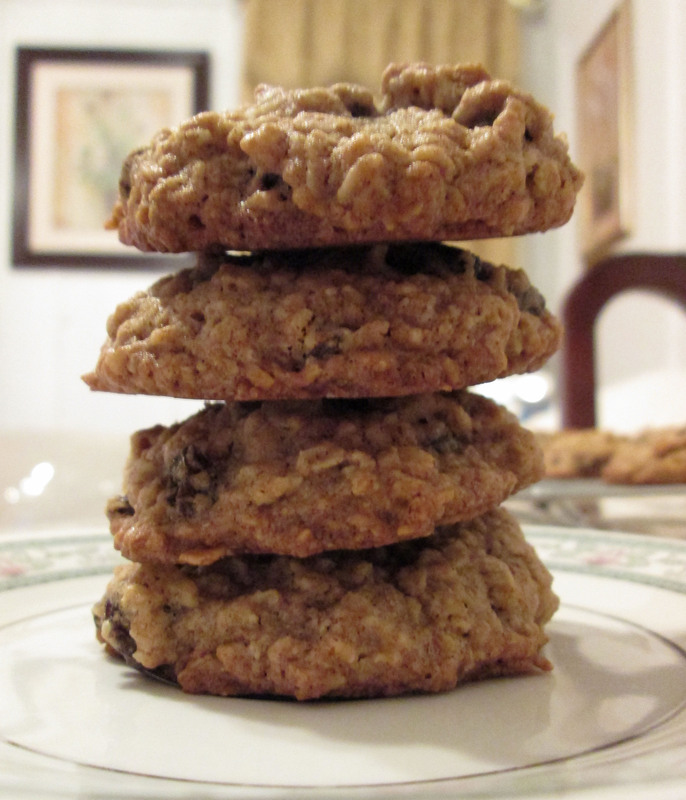 The oats made them chewy, which went great with the soft chocolate and sweet butterscotch chips. And then the pretzel. Easily the best part of the cookie! 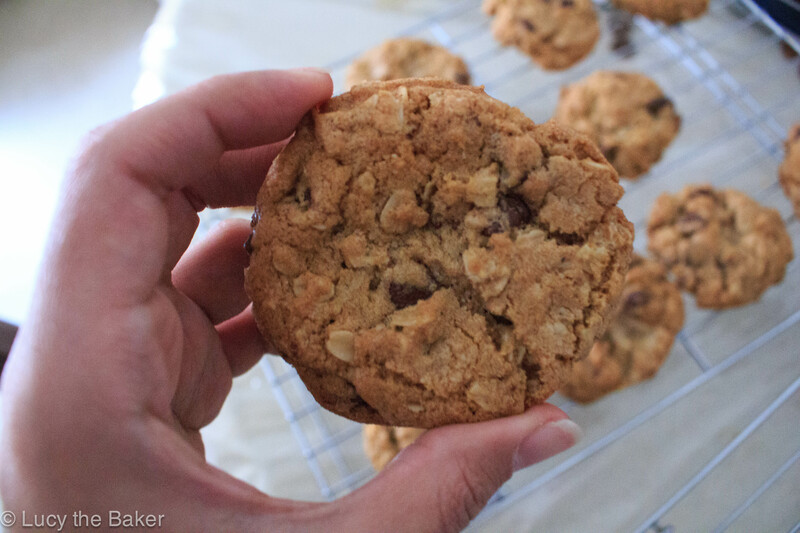 I was worried the oven would soften them but they stayed crispy atop the cookie, and added a little saltiness. I took my cookies to class with me and they were definitely a hit! My classmates were already supportive of me and my baking endeavors (those sweethearts), so I already felt better about debuting these with them. One of my classmates even said these were her new favorite! To be completely honest, they were the inspiration behind this cookie. I am part of this super new and innovative program called CO*OP that aims to bridge the college to career gap in New York City for advertising and marketing graduates. For those who don’t know, I graduated college over a year ago and have been struggling to start my career ever since. This opportunity kind of fell into my lap this past summer, and I have been rocking with it ever since. We’re the guinea pigs for the program, so things are always changing and we’re just rolling with the punches. Our founder told us from the beginning that we were the pilot, hence the name of these cookies. 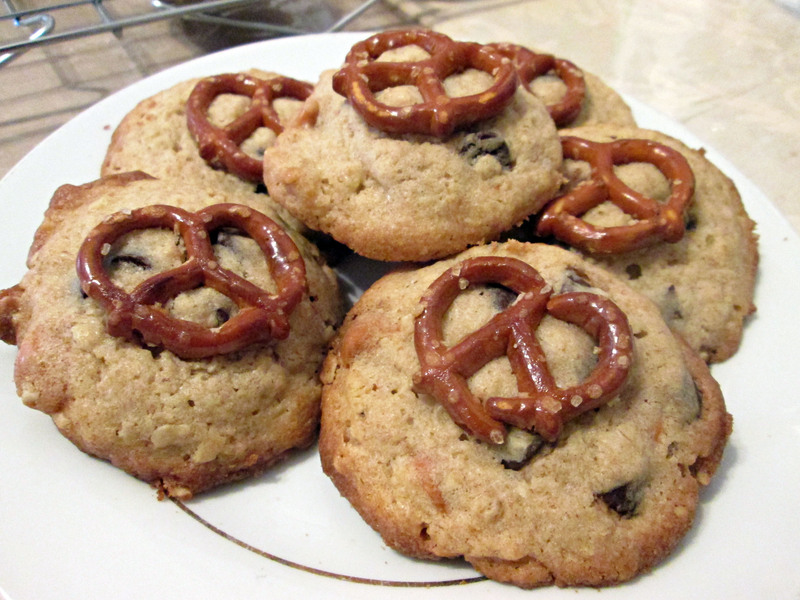 We’re the first group and since this was my first try at creating a sweet recipe, I named them pilot cookies (that, and because ‘oatmeal butterscotch chocolate chip pretzel cookies’ is a mouthful). I learned a lot while creating and trying these cookies out, and definitely had fun doing it. For one, I won’t replace ingredients for others without seeing how it’ll affect the final product. Since these are my pilot, it’s only a matter of time until I start creating more recipes on my own (with Ratio’s help, of course)! For more information on CO*OP, check us (and my face) out here and here. Place the oven racks in the middle of the oven, and preheat to 350F. Line two baking sheets with parchment paper and set aside. In a medium sized bowl, cream together with an electric mixer the slightly softened butter and the sugars until light and fluffy; up to five minutes. Scrape down the bowl with a rubber spatula and add the egg and vanilla extract. Mix until completely incorporated. 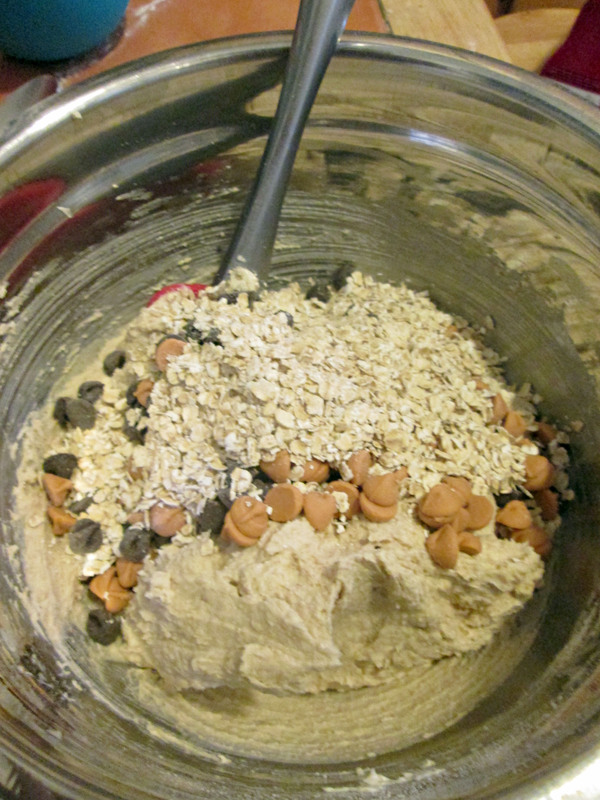 Gradually add the flour mix to the batter, scraping down the sides of the bowl periodically. Do not overmix! 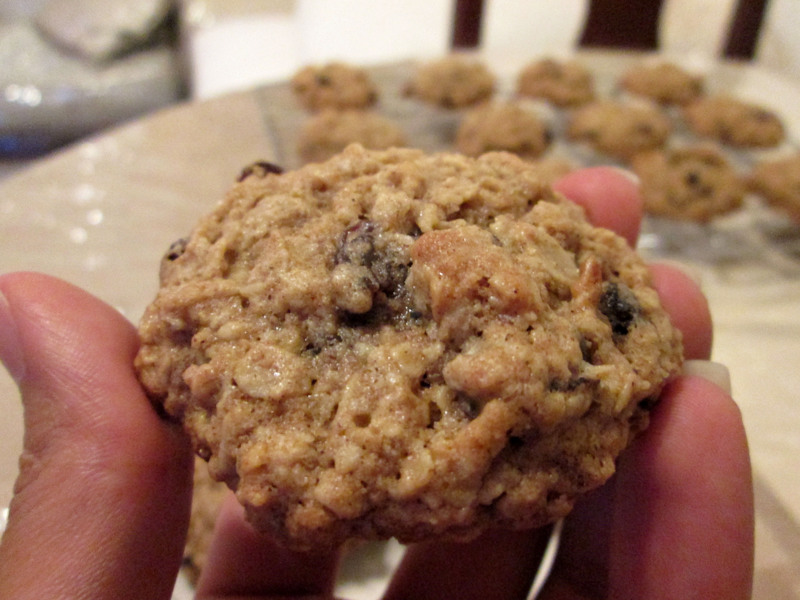 Fold in the oats, chocolate and butterscotch chips with a rubber spatula. 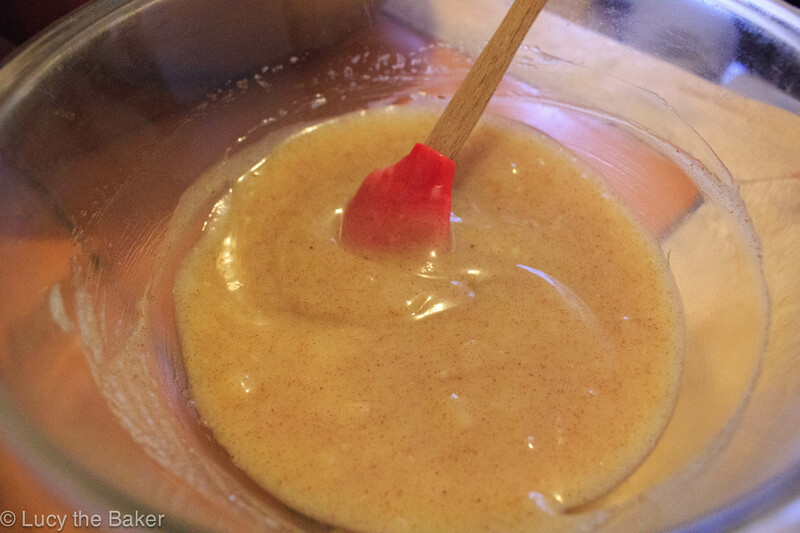 Using a small disher or two spoons, scoop the batter onto the prepared baking sheets, about an inch or two apart. 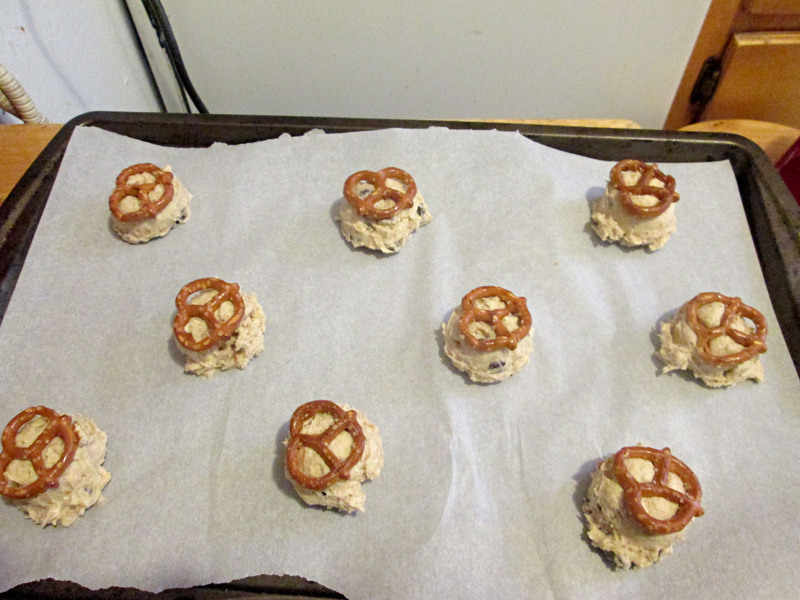 Place a pretzel atop each scoop of batter and gently press down so the pretzel sticks to the cookie dough. Bake for 12-15 minutes, or until edges are golden brown. Rotate the pans halfway through baking. Cool cookies on the pan for a minute before transferring to racks to cool completely. For storage, place in an airtight container at room temperature. Cookies should keep for about a week. Make sure your butter is room temp and slightly softened; not completely softened, as that will affect your final product. If your butter got too soft, make the batter and refrigerate for 30 minutes to an hour to firm the dough back up. To know if your butter is ready, gently press it with a finger. It should be firm, not too cold, and your finger should only make a slight indent. To prevent overmixing, incorporate the last bit of flour with a rubber spatula instead of the mixer. It’s also a good opportunity to scrape the bowl and make sure all the flour is incorporated. I use a #50 disher (similar to this one), which holds 1 1/4 tablespoons of dough. Feel free to use a larger one or two spoons to scoop your batter. To rotate your pans during baking, switch the top tray and the bottom tray (so the top one is now on the bottom rack and vice versa), and turn them 180 degrees. Sounds confusing but I hope that makes sense!